Инвестиции. Дивиденды по акциям. Волновой анализ рынка. S&P500 3rd July, 2017. Thought process for developing an alternate wave count. 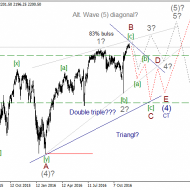 Главная / Видео / Elliott Wave Technical Analysis by Lara / S&P500 3rd July, 2017. Thought process for developing an alternate wave count.